FAQ: What options are available for 5,000 gallon water storage tanks? Question: I see you have a lot of water storage tank options. I want a 5,000 gallon water storage tank and I am wondering what options are available to me. Answer: Our water storage tanks can be built from a variety of materials. Choose from collapsible pillow tanks, poly tanks, or steel tanks. periods or for many years indoors and outdoors. Our pillow tanks are made from heavy duty industrial fabrics which are approved for contact with stored liquids. An MSDS may be required for some chemicals to determine contact times and best materials for the storage application. This ensures correct materials and configuration for each and every project! 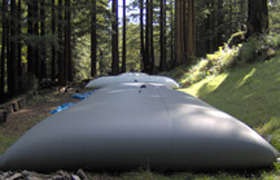 Poly Tanks are manufactured with linear polyethylene. A poly tank can have several applications including chemical mixing, chemical storage, agricultural use, drinking water storage, septic storage, and much more.